While Dead Rising fans are waiting for the first game's hero's triumphant return in Dead Rising 2's Case West expansion they can relive the glory days with Dead Rising Mobile starring Frank West. He's covered wars. We know. We found out about Dead Rising Mobile back in October, and now it's finally here. The iPhone game is a touchscreen-powered version of the original game, complete with tons of weapons and tons of undead to destroy. In a social twist, when you die in Dead Rising Mobile you can send out help requests via Facebook and Twitter. If your friends revive you, they score a bonus point. If they don't, you can come back to haunt them as a named zombie in their copy of the game. Creepy! 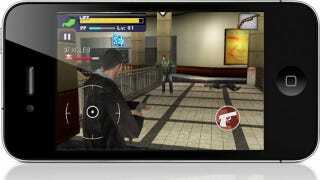 Dead Rising Mobile is now available for $4.99 on the iTunes App Store. Note that the game will only run on an iPhone 3GS or better or third and fourth geration iPod Touches with iPad compatibility coming in the next update.